Do you want to remain healthy and fulfilled? If yes, then you need to understand cross addiction, and how to take deliberate steps to say no to drugs of any kind. Cross Addiction is a situation in which a person addicted to one substance (e.g., alcohol), more easily becomes addicted to another substance (e.g., drugs from the benzodiazepine group), because they allow to reduce the abstinence syndrome experienced when trying to discontinue the first substance. In the case of alcoholism, it is most often combined with psychoactive drugs from the benzodiazepine group. These drugs have hypnotic, sedative and anxiolytic effects. With the development of alcoholism and the difficulties associated with it, reaching for drugs becomes an antidote to alleviate the unpleasant effects of drinking. Indeed -- there is a temporary improvement in well-being, but the addiction mechanism begins to work much faster and with greater force. Of course, the coexistence of addictions does not only include the combination of alcohol and drugs, it is just one of many examples. What is important, cross addiction does not always combine two psychoactive substances. It can take the form of a complex drug addiction and gambling (behavioral addiction). Cross Addiction occurs when a patient starts using two substances that have similar effects on the nervous system (eg two sedating agents -- alcohol + benzodiazepines). In practice, therefore, we have a situation in which an alcoholic very easily becomes addicted to sedatives (that is, he is still addicted, but from a different substance). In cross addiction, the patient may use two different agents that act in a similar way on the body to enhance their function. For example, drink smaller amounts of alcohol, but at the same time take sedatives. Apparently, there is a process of treatment with alcohol, but in practice nothing changes. We will not deal with cross-addiction when the patient takes two agents that act differently on the body (eg alcohol + amphetamine). Then we deal with mixed addiction. While there are no specific data on the rates of cross addiction, abuse of polysubstance is very common.This is evidenced by the high rates of people admitted to the emergency departments who are under the influence of many substances. People often mix different substances so as to enhance high effects or to counteract the undesirable effects of one substance.This kind of continued abuse of polysubstance may lead to severe cross addiction. Addiction is generally a common occurrence United States. A survey carried out by the National Survey on the Drug Use & Health (NSDUH) shows that in 2014, only 21.5 million individuals from America of age 12 or older were struggling with substance abuse. Most people were struggling with alcohol abuse, and others struggled with abuse of drugs as well as alcohol. 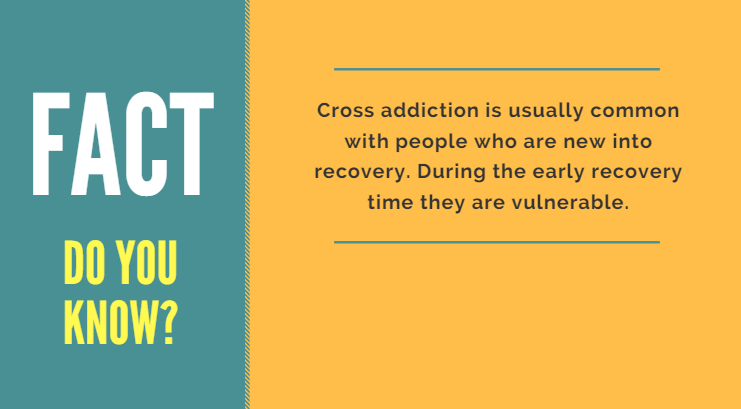 Cross addiction is usually common with people who are new into recovery. During the early recovery time they are vulnerable. It is likely that individuals will go for another substance abuse. According to experts, 25% of those in recovery period will begin to abuse another substance. A research work which was conducted in 2004 in a journal named Addictive Behavior found evidence of grouping various types of addictions together according to the function the drug served. People with substance use disorders based on substance classification, were believed to have a higher risk in developing a substance use disorder. This is the same substance within the classification, which is consistent with the cross addiction aspect. This second premise may not have been tested by this study. The basis of the notion has an increased vulnerability which might reflect similar characteristics of certain drugs was actually demonstrated to have some validity. A 2008 study in a Journal named Addictive Diseases found out that participation in a program of methadone maintenance treatment, meant for Opioid use disorders, was related to a reduction in cocaine usage and alcohol. This finding goes against the said notion of a cross addiction. 2010 study cited in a journal of Drug & Alcohol Dependence,made a report that 28 daily marijuana users used in a study who had an alcohol use disorders history increased the alcohol consumption during time of abstinence to marijuana. This was believed to be a consistency with the drug substitution hypothesis which is closely related to cross addiction notion. It is quite a common mistake to confuse cross-addiction with mixed (that is, addiction to more than one substance). In mixed addiction, addiction proceeds differently than in cross addiction. Most often we are dealing with the intake of several substances from different groups that have different effects on the body. For example, a patient drinks alcohol that calms him down, then takes benzodiazepines to deepen the state of calming. Excessive sedation occurs, so the patient accepts amphetamine to stimulate. There is anxiety, so the patient goes back to benzodiazepine. This juggling with psychoactive drugs keeps him in an unstable balance and as a result it is difficult to assess which addiction is primary. The dependency potential is not a fixed factor, some substances lead to dependency faster than others, but the personality of the consumer also plays a decisive role. Dependence on two or more substances? Why are so many addicts multiple addicts and which addiction must be combated first? Multiple dependence refers to the simultaneous dependence on chemical substances from different pharmacological groups, such as opiates and alcohol. With a narrower interpretation of the term, i.e. including nicotine, for example, the majority of addicts are now dependent on more than one substance. A combination of non-substance-bonded and substance-bound addictions, such as gambling addiction and alcoholism, has two addictive diseases, but the diagnosis of polytoxicomania is not used. This also applies in those cases where one addiction follows another but the substances were never consumed at the same time. In general, once someone has become addicted to a drug and consumes other mood-changing substances, the risk of becoming addicted to these substances increases significantly. Simply put, a heroin addict tends to be a cannabis abuser, although he has never smoked a joint. Physical factors can play an important role here. Once someone has developed an increased tolerance to a drug, he or she automatically has an increased tolerance (cross-addiction) to a drug of the same class. For example, an alcoholic is particularly susceptible to becoming dependent on sedatives because they have the same chemical mechanisms of action. This is also shown by the fact that the risk of a relapse for alcoholics increases if the doctor prescribes painkillers with tranquilizers in the case of an illness. At this point we would also like to point out that before an upcoming operation with anesthesia, the anaesthetist's questions about alcohol and drug or medication consumption should be answered completely honestly, otherwise an incorrect dosage with fatal consequences could occur. For substances of different classes, the risk is particularly high if they have a similar physical effect. Psychological factors also play a major role in the development of multiple dependencies. Many studies have shown that the psychological desire to be "high" can be satisfied by any mood-changing drug. The addicts are the focus of addiction. But what about relatives who live with an addict, are friends or relatives? The term "co-dependence" originated in the late 1970s in the USA with the extension and change of the diagnosis "alcoholism" to "chemical dependency", i.e. dependence on chemical substances. It describes the behaviors, attitudes, roles and disorders that arise in the course of the addiction that people who have been or are closely related to an addict for a long time assume. This can be a relationship as a child of dependent parents or as a partner, parent, relative, friend, and colleague. The central statement is that everyone in an addict's environment is also affected by the addiction and more or less changes with it. This means that not only the addict should be treated, but also the immediate social environment should be included in the treatment. First an attempt is made to help the person affected, but at some point the relatives realize that they are powerless and that they are "involved" in the vicious circle of addiction. Often the addiction of others becomes their own purpose in life. It is very important that the relatives seek help themselves, exchange information with other affected persons or undergo therapy. Specialists indicate that the treatment of cross-addiction is much more complicated. Particularly noteworthy is the fact that such addictions are increasingly affecting young people who are trying to cope with everyday stress in this way. Combined are boosters or drugs with alcohol, gambling with sexism, or alcoholism with alcoholism. Very often, the problem affects people who have historically successfully undergone drug rehabilitation for one addiction. Therefore, multidimensional therapeutic treatment requires commitment and double workload. When treating addiction, you need to pay attention to what other agents and substances you are taking and at the same time to ensure that there is no cross-addiction. If this addiction has already occurred, the therapist usually first redirects the addiction towards the least threatening agent. At the same time, it is necessary to ensure that the patient does not suffer serious health complications related to the interaction of substances (e.g., taking large doses of aspirin to enhance the effect of alcohol, which causes gastrointestinal bleeding). A patient suffering from the withdrawal of the substance on which he is dependent can reach for a product from the same group, i.e. one that is affinity for the same receptors and has similar effects. The drug addicts quite often "heal" abstinence symptoms by drinking large amounts of alcohol, which calms down and relieves pain. Unfortunately, such an action is short-lived and does not solve the problem (it can be compared with the adoption of aspirin when we have a headache). Such a complex situation can be a great challenge for a diagnostician. It is very important to correctly determine whether the use of a given situation is only occasional or whether it meets the addiction criteria. It may be difficult for many patients to underestimate the problem by considering smoking, drinking alcohol or taking medication as normal, harmless habits. One of the difficulties is to get to the truth and to make the patient aware of his or her own problems. People who are prone to becoming addicted are characterized by a specific way of living. They do not have proper contact with their emotions, they do not tolerate frustration well, they are often unsure of themselves and they need stimulation which will give them hitherto and allow them to forget about the problems. Frequent drinking of alcohol or taking drugs makes the patient accustomed to the adrenaline, euphoria and excitement they cause. Not only does his body become addicted, but also his psyche, which demands subsequent moments of carelessness, happiness and increased energy. The search for sources of such emotions often leads to further threats. It does not have to be another psychoactive substance - behavioral addictions such as erotomania, pathological gambling or shopping-holism often occur. A person addicted to shopping does not notice that he spends too much money, devotes a lot of time to waving around the shops and becomes a victim of a dangerous obsession. What counts is the emotional state resulting from a successful search: joy, pride and excitement. In reputable centers, every addiction therapy is psychotherapy. However, not every psychotherapy is suitable for the treatment of addiction. This should be borne in mind when deciding to meet a psychotherapist. Certainly, the way out of addiction must start with detoxification (purification) of the body from the psychoactive substance. The duration of this step depends on the type of psychoactive substance, the duration of the last run and the general state of health of the patient. For example, in the case of alcohol, the duration of a detox usually takes about ten days. Then the patient should start the basic treatment of the addiction. In stationary centers it lasts from 6 to 8 weeks (24 hours). After this stage, the in-depth therapy begins. It can last up to 1.5 years. It is believed that full addiction therapy should last up to 2 years. The transition between the different stages of therapy depends on the individual progress of the patient. The objectives of psychotherapy for addiction are clearly defined. After the end of the treatment phase, the patient should be able to maintain abstinence without great difficulty and cope with the emerging hunger for the psychoactive substance. The patient should also learn to self-observe and avoid situations conducive to drinking. Sometimes, however, these skills are not enough to achieve a permanent and certain abstinence. It may also happen that the patient, after completing the addiction therapy, does not gain full satisfaction from his life and requires further psychotherapy. The problem of addiction affects not only the addict himself, but also his entire family system. It often turns out that the addict grew up at home with an alcohol problem and has the characteristics of an adult alcoholic child. Problems resulting from this can be worked out during psychotherapy. Some addicts, mainly women, became addicts when they were related to a drunk person. Here too, codependency psychotherapy can be helpful. Finally, the addict may have other problems unrelated to the use of the psychoactive substance, such as endogenous mood disorders or personality disorders. Psychotherapy can also be helpful for this group of people. The principle in most addiction centers is that further psychological support for the addicted patient should absolutely start after an effective treatment of the addiction problem. Only then can the co-dependency treatment be started, followed by a possible syndrome. Personally, however, I am of the opinion that while it is very important to maintain abstinence, it is not worth keeping rigidly to the rules governing the order in which patient problems are resolved. There are situations which require dealing with the main problem of the patient, e.g. far-reaching rejection of oneself behind it will be possible to work on the problem of addiction after this stage the in-depth therapy begins. It can last up to 1.5 years. It is believed that full addiction therapy should last up to 2 years. The transition between the different stages of therapy depends on the individual progress of the patient. The patient should also learn to self-observe and avoid situations conducive to drinking. Sometimes, however, these skills are not enough to achieve a permanent and certain abstinence. It may also happen that the patient, after completing the addiction therapy, does not gain full satisfaction from his life and requires further psychotherapy. Problems resulting from this can be worked out during psychotherapy. Some addicts, mainly women, became addicts when they were related to a drunk person. Here too, codependency psychotherapy can be helpful. Finally, the addict may have other problems unrelated to the use of the psychoactive substance, such as endogenous mood disorders or personality disorders. Psychotherapy can also be helpful for this group of people. There are situations when the main problem of the patient needs to be dealt with, e.g. far-reaching unacceptability to accept him/her, it will be possible to work on the problem of addiction. To avoid the phenomenon of developing a cross addiction, the appearance of physical, psychological and social symptoms must be monitored. Being in the "recovery process" means being responsible and working hard on the above factors, carrying out a balance in life without ever forgetting the fundamental role of professional help, doctor, psychiatrist, nutritionist, psychologist, specialist in addictions and assistance regular self-help group as well as open communication with family members and sponsorship.